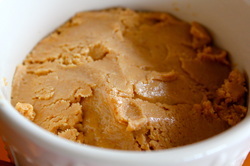 This is so easy you will be wondering why you haven't made peanut butter before. All you need is peanuts, almonds or cashews . You can also add a very small amount of peanut oil, a pinch of sea salt, some honey, or a touch of chocolate. Add the extra ingredients right along with the peanuts and blend.